Trendy Bride wedding magazine is a luxury annual publication designed with today's bride in mind. We feature the latest bridal looks straight from the runway, real weddings that span the globe, and creative styled shoots that uncover ingenious, never-before-seen ideas. Trendy Bride Magazine seeks the most innovative, stylish, and mesmerizing concepts to inspire and invigorate the imaginations of brides as they plan the wedding of their dreams. From engagement photos to wedding exits, we cover them all – in a stunning and artistic way. 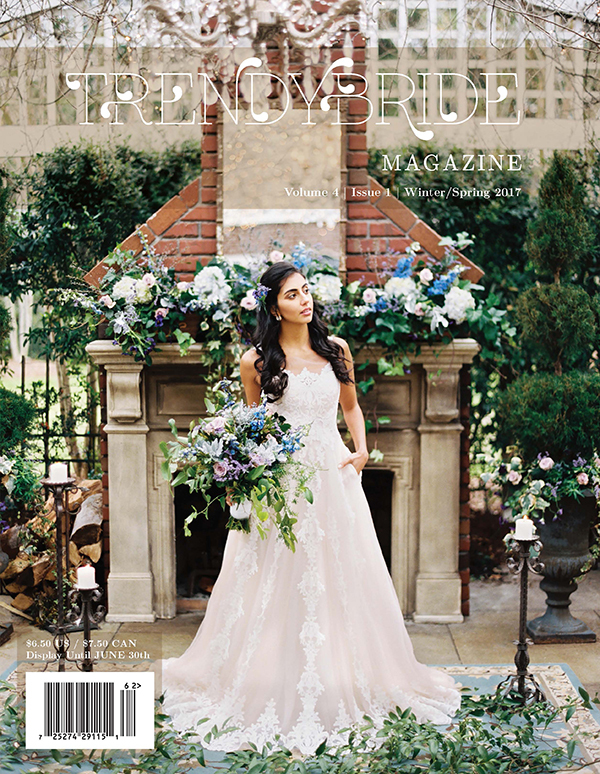 From bold red hues to timeless antique touches and even to an unplanned elopement, this issue promises fresh and inspiring ideas for weddings of all designs and sizes. Featured within our pages are real weddings to take you from from California to Italy, styled shoots to enliven your senses and encourage your own wedding vision, and the latest in bridal fashion to speak to brides of all styles. It's all featured in our 2017 issue. Get your hands on a copy today! Learn more about our local publication called, The Carolinas Magazine. You can pick up a copy at your local Barnes & Noble bookstore or order a copy online today.